That’s why we’ve created the Recess Checkup – an online quiz designed to help you identify strengths and uncover areas for improvement. Take our three-minute check-up, and we’ll help you understand what’s really happening in your play space. And don’t worry – we won’t share your results with anyone. Discover what’s working and uncover areas for improvement, so that you can promote a safe and healthy school environment. Receive tailored recommendations for making improvements where they’re needed the most. Our Recess Checkup will lead you through the 3 areas we’ve found to be most essential for all schools – safety, empowerment, and engagement. 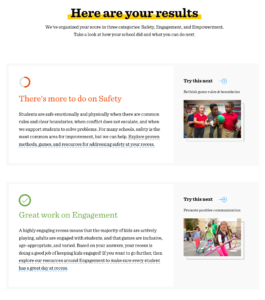 Answer questions about what’s happening in your school, and see how you’re doing and how to take steps to ensure a safe, active, and fun play culture.